House Targaryen is known for their dragons. Konig Motor will forever be known for this interesting creation. Everyone known that House Targaryen&apos;s sigil is a three-headed dragon (Game of Thrones reference, anyone?). 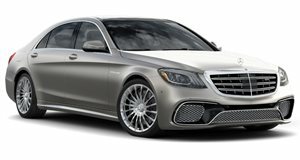 Konig Motor&apos;s dragon, however, might as well be a Mercedes-Benz S65 AMG that deserves to be destroyed by the famed Valyrian house&apos;s words, in a mixture of Fire and Blood. Designed by the Mad King (or whoever thinks up the Russian company&apos;s wraps), the body of the car appears to have the texture of scales, the lights have been covered with dragon eyes and the rear has been designed to have a tail-ish look. The Mercedes-Benz S65 AMG doesn&apos;t breathe fire but it does pack a 612hp punch from its V12 engine. Pricing for the dragon-wrapped Merc is set at two million rubles ($68,200) which is, conversely, enough money to buy horses, an army and ships to sail to Westoros. Or anywhere that isn&apos;t Russia.